Weekly tours to Spaceport America, located 35 miles southeast of Truth or Consequences, are departing from the Spaceport America Visitor Center on most Saturdays at 9am and 1pm — see the Spaceport Tour web page for details. Or call +1-575-267-8888 to arrange a tour. Allow 4 hours to tour the Spaceport. All tours require a minimum 24 hour advance reservation and are subject to change or cancellation due to mission control requirements. Walk-ups will be accommodated whenever possible but are not guaranteed. Cost ranges from $59.99 (online same day) to $24.00 (STEM-affiliated groups). Please see the website for pricing. The Geronimo Trail Scenic Byway Visitor Center, located at 301 S. Foch in downtown Truth or Consequences, is open Monday through Saturday from 8:30am until 4:30pm and Sunday 9am-2pm. PLEASE NOTE! 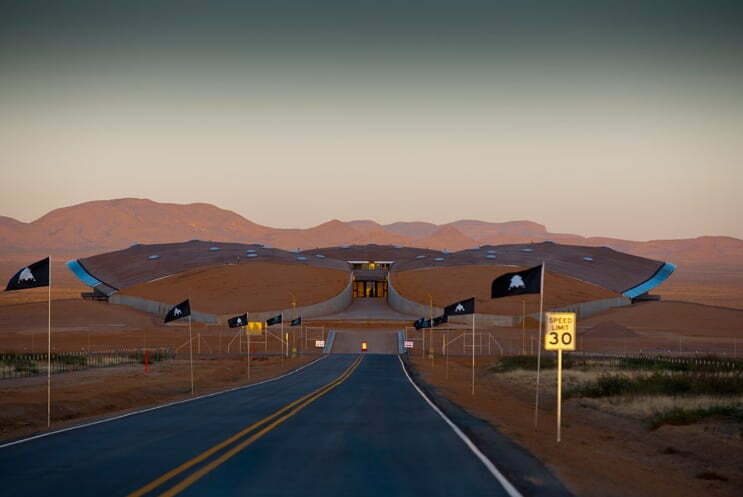 We strongly recommend that you do not drive out to Spaceport America on your own! Due to its remote location there are no service stations, restrooms or other amenities along the way, and cellphone service is limited at best. Individuals who drive out on their own will not be allowed onto Spaceport property. Video of the Spaceport America Tour is shown in this New Mexico True video. The Spaceport segment begins at 9:30 and ends at 11:50.